New York Outrigger is pleased to have Calexico as one of the food vendors of the 2013 Hawaiian Airlines Liberty Challenge. Follow the aroma of carne asada to their cart in the Dining Area at the Liberty Festival at Hudson River Park’s Pier 26 on Saturday, June 22. Be sure to try their expanded menu of gourmet mexican street food at their brick and mortar restaurants or seek out their carts throughout the City through their twitter page. Calexico is a real place. One of two major crossings between California and Mexico, the border fence runs right through the middle of town. Take a step south and you’re in Mexicali; a step north, Calexico. This is not the California of surfers and movie stars. This is the Imperial Valley: hot, dusty, and off the beaten path. As the name suggests, everything about Calexico is a hybrid: the people, the culture, and especially the food. When the three of us moved to New York City, we were blown away by the variety and quality of the food. But no matter where we looked, we couldn’t find anything that could satisfy our craving for our hometown cuisine. So we began cooking – first for ourselves, then for friends. People liked it.They told us we should start a restaurant. Right, we thought. A trio of hobby cooks opening a restaurant in the most sophisticated food city in America? Not likely. But then we had a idea: what about a taco cart? This was before the street food craze. Back then there weren’t even food trucks in New York – just pushcarts. And those carts tended to sell a few New York staples like hot dogs and pretzels. 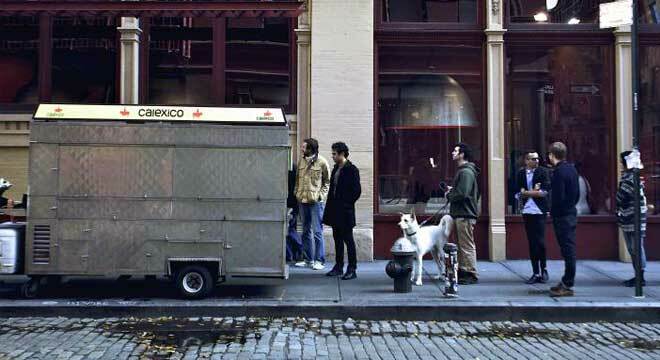 Would a taco cart work in New York? It seemed a little far-fetched, but we thought we’d give it a try. After all, there is no better street food than a taco. That’s just science. So we found a cart, dug into Grandma’s recipe box, and rolled out onto the streets of New York City. It was tough at first. People were wary of street food back then, especially Mexican food cooked by a bunch of Gringos from California. But slowly, it started to catch on. Lines began to form. We couldn’t keep up with demand. We started saving up for another cart. In our second year in business, we won the Vendy Award for Best Street Food in New York City. The Vendys are like the Oscars for street food. And it changed everything for us. Suddenly we found ourselves being interviewed for newspapers, magazines and even TV shows – including one surreal episode of The Martha Stewart Show alongside Mayor Bloomberg. Fast-forward a few years. We’re still out there slinging tacos and burritos on the streets of New York, only now instead of one cart we have a small fleet. And that crazy notion of a restaurant? It came true, a few times over. Nobody is more surprised by this development than we are.